The summer of 1987 saw some big changes in the appearance of Haig Avenue. Following ground safety recommendations all the covered terracing on two sides of the ground had to be demolished and for the next six years only the main stand afforded protection from the elements. Four upright stanchions and a cross-piece were all that remained at the Scarisbrick New Road end as a gaunt reminder of happier days; on the ‘popular’ side the bottom six steps of the once twenty deep terracing were left in place. With Multipart withdrawing their sponsorship, the league reverted to the N.P.L. 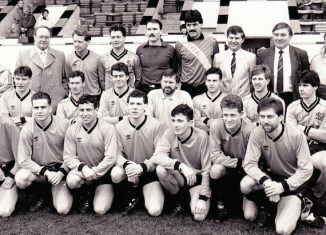 for 1987-88; but Southport’s season proved a huge disappointment. At the outset it threatened to surpass all that had gone before, since, by October 3rd, the club had won eight and drawn the other three of their opening eleven games, with a mere four goals conceded. Young Rob Sturgeon, whose father, the Liverpool comedian Bobby Kaye, was newly appointed vice-chairman, had developed into a commanding central defender and celebrated his moth N.P.L. game early in the season. Paul Lodge lent support in midfield after Peter King departed to Marine. Southport reserve player back in the ‘sixties. A period of flux ensued as the axis of the team shifted from Merseyside to central Lancashire. Paul Evans returned in goal, while one by one Coleman, Lodge and full-back Robbie Armstrong departed, the last named for a gross breach of club discipline. The club finished 14th in the table and lost two cup finals, the N.P.L. President’s Cup disappearing 4-5 to South Liverpool over two legs after Southport had, at one stage, led 3—o away. One N.P.L. Cup game is worthy of note, if only for the attendance — at Haig Avenue — of just 77 spectators. The game was played in hurricane conditions; goal-kicks going behind for corners were not uncommon — Paul Evans put one such out of the ground behind him! David Eyres, who finished top scorer for the season, scored both the goals which beat Gainsborough Trinity 2-I, one of which not unexpectedly flew in directly from a corner kick. It was a tribute to both sets of players and the officials that the game was completed at all.